There are a lot of factors to consider when you price your self-published book. Of course, you want to make the most possible, but you don’t want to be uncompetitive. It’s a delicate balance. So before we talk numbers, here are a few things you need to think about. 1: What is your publication goal? Are you trying to reach as many readers as possible, get as many reviews as possible or spread a message, in which case, you would be happier selling at a lower price if it enabled you to have a larger audience. Are you using your book to grow your brand, and get people interested in you and buying some of your more expensive products, e.g. a life coach who has written a book to get known and get more clients, in which case, you can afford to price it cheap. Are you writing a series; if so, you might want to price the first book lower than the following books to get people hooked. Are you writing to achieve a financial goal? Think about why you wrote and published this book and have a pricing strategy that supports that. 2: How competitive is your genre? If you have written in a very commercial genre such as crime fiction or romance, you will have a lot of competition and your potential buyers will be price sensitive. If you are an expert, writing about a specialty that not many other people have covered, then you can charge a bit more as you don’t have so much competition. Spend some time snooping on Amazon (always a worthwhile activity for a self-published author), check out the charts you would ideally like to rank in, drill down to the sub-charts and check out what sort of price books like yours are going for. Note, I’m talking about the RRP here, not the discounted price. 3: Where will your book be sold? If you’re working with us, we will set you up with a Create Space account so your work is available on all Amazon sites, and also an Ingram Spark account so your work is available to hundreds of other retailers off and online globally. However, some authors like to cut the middle man out and maximise their profit by selling books directly, e.g. via a PayPal cart on their website or at seminars and events. Do you have plans to sell your book directly? Now head over to https://www.createspace.com/Products/Book/ and hit the “royalties” tab. Plug in the data above and the calculator will tell you how much you will make (your net profit) at each price point. This is after Amazon have taken their cut and the cost of printing your book has been covered. It’s pretty straight-forward. The idea is you put a few different prices in to work out what you would make at each price point. In my example above, I tried £7.99, £8.99 and £9.99. The price in the Royalty column is what you will receive for each copy sold in that currency, i.e. how much Amazon will pay you. The one at the top, USD, is slightly more complicated because you have 3 options: Amazon.com (this is the important one and where you’ll sell the most), eStore (this is the Create Space store, in reality, most people will buy your book via Amazon, not this, but you could share links, e.g. on your website etc. to make a bit more per sale) and Expanded Distribution (this is Amazon’s larger network of retailers but you will make more money going to the same retailers via Ingram Spark, so if we are setting you up with an Ingram Spark account, ignore this). After completing this exercise, you should have a good idea of what you want to price your book at and are ready to move on to the next stage. wholesale discount – this is the discount you want to give Ingram Spark. They take a cut of the retail price, otherwise they would not be able to offer it to retailers below the RRP, and they wouldn’t make any money themselves. The lowest you can set this to and still have your book sold through their whole network was 35% at the time of writing. That means if your book is £10, you let Ingram Spark sell it to the retailers in their network for £7.50. If you plan to be stocked by large bookstores such as Waterstones, you may need to increase this to around 50%. Ready? Go to https://myaccount.ingramspark.com/Portal/Tools/PubCompCalculator? and fill in the details just as you did with Create Space but adding in the lamination and wholesale discount above. Lastly, you’ll need to enter your price and choose your market; in my example, I have chosen the UK. So you can see you would make slightly more per sale on Ingram Spark than on Amazon in the above scenario. In reality, most of your book sales will probably be through Amazon, they are the biggest retailer in the world after all, so let that guide you. Choose one price and use the same one for both Create Space and Ingram Spark. Why don’t all retailers sell my book for the price I set? In the UK, retailers are now legally able to sell books for whatever price they want. This is also true of some other countries. You have probably seen book price wars, e.g. when a big book comes out like the latest J. K. Rowling, retailers are desperate to get your custom so heavily discount the book. There is nothing you can do about it – they won’t notify you – and in any case, it doesn’t affect how much you make – they are taking the discount out of their share, not yours. Yes, it’s quite simple to change the price (RRP). Firstly, you will need to get your designer to change the price on your cover files. Then all you will need to do is log into your Create Space and Ingram Spark dashboards to alter the price and upload the new cover files. Do I need to put the price on the back of the book? You don’t have to, but it makes you look much more professional if you do. I hope you have found this article useful and it has given you a quick lesson in book pricing. If you have any other questions on how to price your self-published book, please leave them in the comments box below and I’ll answer them ASAP. With more and more self-published authors striving onto and up the Amazon charts, we look at what it takes to be a bestseller and share some of the best advice from those at the absolute top of their game. All of these authors have a very serious, professional attitude to their writing career and have taken the time and energy to get things right from the very start. Needless to say, they have sold hundreds of thousands in territories all over the world. Take their advice and follow in bestselling footsteps. Having invested hours of your life on your manuscript, not to mention all that blood, sweat and tears, you don’t want beginners’ mistakes and sloppy errors to put readers and reviewers off; you want to give your readers the best reading experience possible. However, every writer reaches a point where they can’t see the wood from the trees. This is totally normal. When you work on something closely for a long time, you start to miss things. At this stage, you need to bring in a fresh pair of professional eyes. You will be amazed at how much an editor or proofreader can pick up, and how much better your writing will be after they have been through it. Adam Croft is a UK bestseller who has sold over half a million books to date and reached the top of the charts in the UK, US and Canada. His debut, Her Last Tomorrow, sold over 150,000 copies before being snapped up by Amazon’s own publishing imprint. Our editorial team is headed up by Leila Dewji, who has a Masters in English Literature from Oxford University, and has been working with authors to help them improve their writing for years. She and her eagle-eyed editors and proofreaders work directly with authors to help them develop their writing skills, hone their craft, and, of course, make sure their readers get the best experience possible. They work with authors at all stages – from those who have an idea they need help structuring, to those who are pretty confident in their work, but want to be sure they haven’t made any silly mistakes or typos. Find out more about our editing and proofreading services here. With attention spans getting shorter and shorter, you want a cover that really grabs readers’ attention, even if they are scrolling through Amazon charts on a smartphone and only seeing the cover at thumbnail size. Cover design is a niche skill and not something any artist or graphic designer can turn their hand to. A cover designer knows not only how to create a beautiful image, but one that conveys the right message to the right people, which results in sales. It’s an important thing to get right because your cover design will form the cornerstone of your author brand – the colours, fonts, styles etc. you choose for your cover should also be used on your business cards, author website, social media graphics etc. You want to be looking good everywhere! Having a good cover design is a really quick and effective way to impress readers and stand out from the competition. Our award-winning design team have years of experience and each designer has their own speciality, which means we can match you up with the perfect designer for your book. Whatever genre you have written in, your designer will understand the needs, styles, and nuances of that genre and its readers. This enables them to create a gorgeous design that clearly appeals to the right readership and works hard to sell your book. Bestsellers know who their target readers are and successfully reach out to them, whether that’s via influencers, reviews, blogs, magazine interviews, freebies, social media, etc. Firstly, you need to have a clear idea of who will read your book – think about the groups of people that might be interested in your book and why. Secondly, once you have established who your audience are, you need a detailed plan of attack as to how you are going to reach them, on and offline. If you don’t have a solid marketing plan, it’s unlikely your book will become a bestseller. Before you publish, you should know which marketing strategies are best suited to your book and your readers and how you are going to implement them. We offer a wide range of marketing support from websites, branding and book trailers to our comprehensive marketing course which, if you are willing to learn, will take you from beginner to marketing wizard! We hope these wise words from bestsellers can help you become a self-publishing success. If you need advice on any part of the self-publishing process, book in for a free 1:1 with Ali Dewji, our publishing and marketing expert, and he will steer you on the right course. Or, if you are not quite at that stage, you can download our comprehensive guide to self-publishing here. Not only is this super-sleek Kindle Oasis the easiest to carry around, you only need to charge it every few months. For those of us who feel we’ve had a victory if our iPhone lasts the day, this is a real selling point. 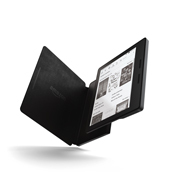 It has been ergonomically designed to be the most comfortable Kindle to hold for hours at a time. It is also the most expensive Kindle ever at £269, and although it’s currently available for pre-order, it won’t be released until 27th April, when the reviews from techies and readers will come flying in. Watch this space. However, unfortunately, Amazon is still yet to develop a Kindle that can handle embedded video, which is a shame when other platforms have been doing this for years. The UK now publishes more than 200,000 a year, a total exceeded by only China (who publish more than 400,000 titles a year) and the US (300,000 titles a year). This is amazing if you consider the relative size of the UK. With all these books coming to market, the competition is getting tough. Michael Bhaskar, Publishing Director of Canelo, comments: ‘It’s hardly a secret that books don’t sell themselves, but when the competition is this extreme that is underlined. What other industry faces so many comparable product launches in any given year?’ What this means, of course, is that marketing is even more important than ever before. As the market gets more crowded, authors need to do everything they can to get their book noticed. This was backed up by the Successful PR & Marketing seminar at London Book Fair’s Author HQ, where this advice was given: ‘Spend 10% of your advance on marketing and PR, aside from what publishers are spending.’ Even traditionally-published authors are having to invest in marketing and PR; the days when authors could just write are well and truly over. Find out more about our marketing services here. Top Kindle bestsellers Rachel Abbot, Keith Houghton and L.J. Ross came together for an event at the LBF Author HQ to inspire authors. When asked what one piece of advice they wished they had been given before they started out, they all said the same thing: ‘Don’t give up.’ Rachel Abbot said, ‘Perseverance is key,’ – you will have knock-backs along the way but if you keep working hard and pushing forward, you will succeed. She also confessed to having low days when she doubted whether anyone would enjoy her books or whether she would get bad reviews. All authors have these ups and downs but the main thing is to just keep going. Keith Loughton added: ‘Try it, and if it doesn’t work, change it‘ – keep trying until you find what works for you. Although this group is not the largest, they buy more books than any others do. Industry experts are calling this ‘The Harry Potter effect’ – the group that are the biggest buyers are the girls who would have been aged between 6 and 15 when the first book of the series was published. This same group are also instrumental in the growth of the YA genre from around 2011 and have made series such as The Hunger Games and Divergent very popular. Top industry analysts, Nielsen say, ‘This generation of women has become an important one for the book industry, seemingly making or breaking genres with their patronage.‘ Authors should think very carefully about how to market to this very influential group. Mark Cocker CEO of SmashWords, has seen the self-publishing landscape change dramatically since he started eight years ago. He is very concerned by Amazon’s dominance and their intention of undermining the value of reading. ‘Amazon is training readers to expect to read books for free,’ he explains, referencing their Kindle Unlimited programme, in which authors must give Amazon exclusivity (in exchange for a few promotional perks) and then their eBooks are free for Amazon’s Prime customers to borrow. Authors do get paid for these ‘borrows’ but they are never sure how much they will get as Amazon changes the goalposts month by month. He warned caution and advised authors to make sure they really knew what they were getting into when it comes to exclusivity deals. If you are considering going exclusively with any retailer, make sure you read the small print and make sure you can get out in a few months if you are not happy with it. Fed up of ‘360-deals’ whereby record companies are entitled to any earnings from absolutely anything you do, whether they put anything into that or not, hip-hop artist Akala and other artists like him are embracing the creative freedom of self-publishing. They love being able to create something the way they want to, with the collaborators they want to and then be able to sell that product directly to their fans without anyone else taking a cut. This is a very new experience for them. Not only that but self-publishing offers an opportunity for a more flexible and diverse publishing scene. ‘Trade publishing underestimates young people from a range of backgrounds,’ Akala commented, citing his work with schools and youth projects. Now indies can fill that space. When asked what advice he would give those considering self-publishing, he said, ‘Outsource the things that you’re not good at to other people.’ He backed this up with an embarrassing anecdote about the perils of not getting your work proofread properly – be warned! According to industry analysts, Nielsen, the UK children’s book market is up 7% in the first quarter (compared to 2015), and kids’ books are on track to have a very good year. The overall size of the children’s book market has swollen from 15% of the total consumer market in 2001 to 24% in 2015, and it looks set to get even bigger this year. This is great news if you are a children’s author. The YA market is down slightly on last year, but is diversifying, with debuts of unknown authors getting more of a look-in, thanks to prizes, so make sure you know which prizes you are eligible for and don’t miss the deadline. So, now you have the hottest industry news, you can use it to get your books and eBooks in the best position possible. If you were at the London Book Fair, let us know what you thought of it in the comments box below.